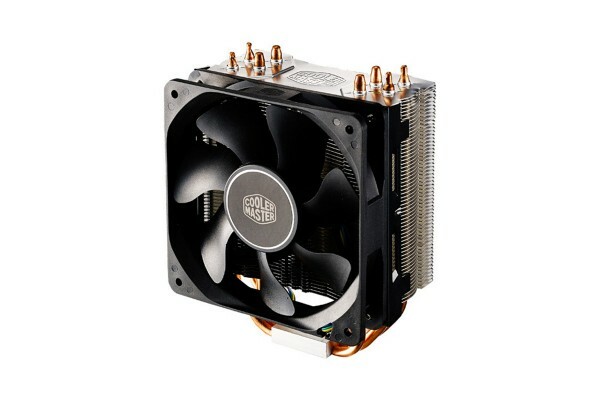 The Cooler Master Hyper 212X includes a PWM controlled fan and provides incredible 9 dBA low noise with a maximum of only 27.2 dBA. Exclusive CDC™ and X-Vent technology, Funnel shaped aluminum fins and a series of perforated dimples create a CPU cooler that is optimized for great heat dissipation. The universal bracket designs ensure easy and worry free installation on every platform. Exclusive X-Vent Technology - Vents are placed at a 45 degrees angle around each heatpipe. Patent “V” Shaped Array - Funnel shaped aluminum fins and a series of perforated dimples guide the airflow towards the heatpipes. Patented CDC™ Technology - 4 Continuous Direct Contact Heatpipes create a gap-less contact surface. Optimized fin design - Aluminum Fin Array with Tunnel Effect layout creates micro vortices that boost the airflow and circulate it around the heatpipes.